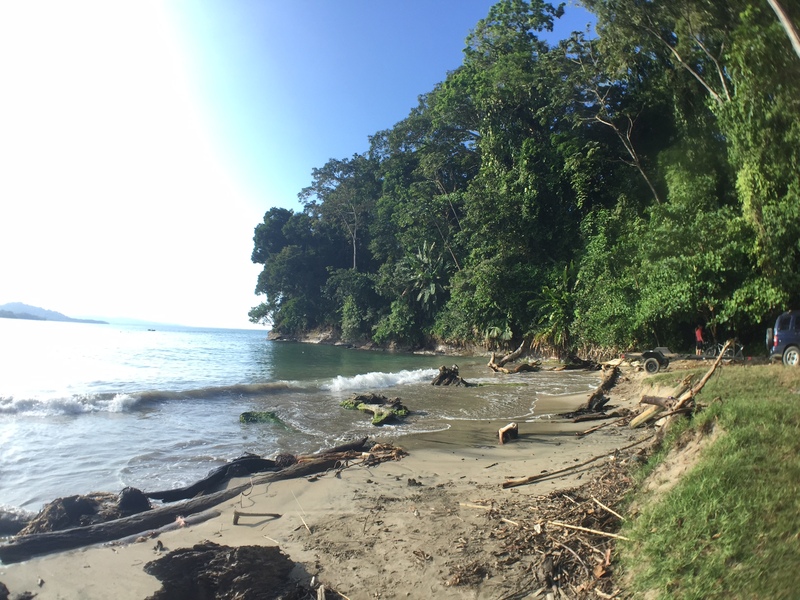 As my time in Costa Rica is coming to a close, it´s hard to believe I´m already saying goodbye to my first country. To quote Robert Frost, ¨But I have promises to keep, And miles to go before I sleep, And miles to go before I sleep.¨ and I have been trying to set my sights on my next…well…sites. 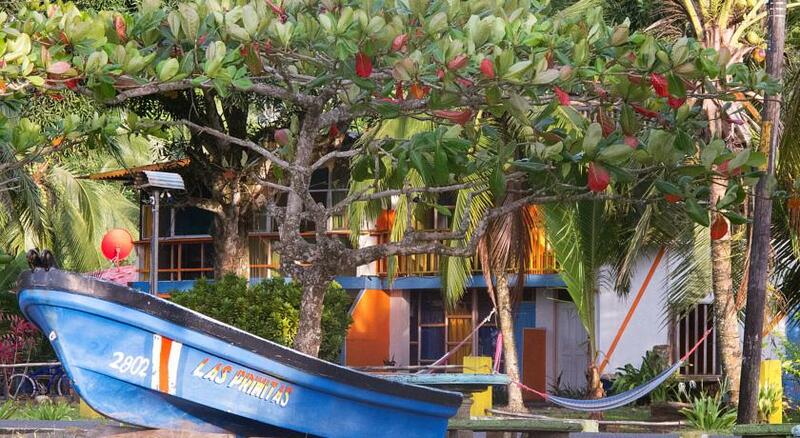 Bocas del Toro, Boquete, and Lost and Found Hostel in Panama for November. Then Panama City, where I´m chartering a sailboat to take me to Cartagena, Colombia and onto Medellin, Colombia for the month of December. But there´s still the matter of reflecting on my time in Costa Rica and what I want to take away from the 6 weeks I´ve spent here in the Carribean. My wonderful soul sister sent me this aptly timed article about the various deaths that occur over our lifetime in the form of our ever-changing identity. It spoke to something I´ll be inevitably dealing with from country to country on my journey – the leaving of one identity in country and the adoption of a new persona in each place. My legs are covered in more bruises and bug bites than I thought possible on one person. My understanding of clean and dirty are completely relative now. The minute differences between needing, wanting, and craving a shower. Sand will most likely accompany me for the remainder of my trip, smuggling its way into the nooks and crannies of my now musty smelling backpack and its ramshackle contents. My patience has grown (in addition to my leg hair) and with it comes a better understanding for the tico way of life, where 10 minutes mean an hour or mañana means a week. I´ve been able to experience a life that people only dream of. 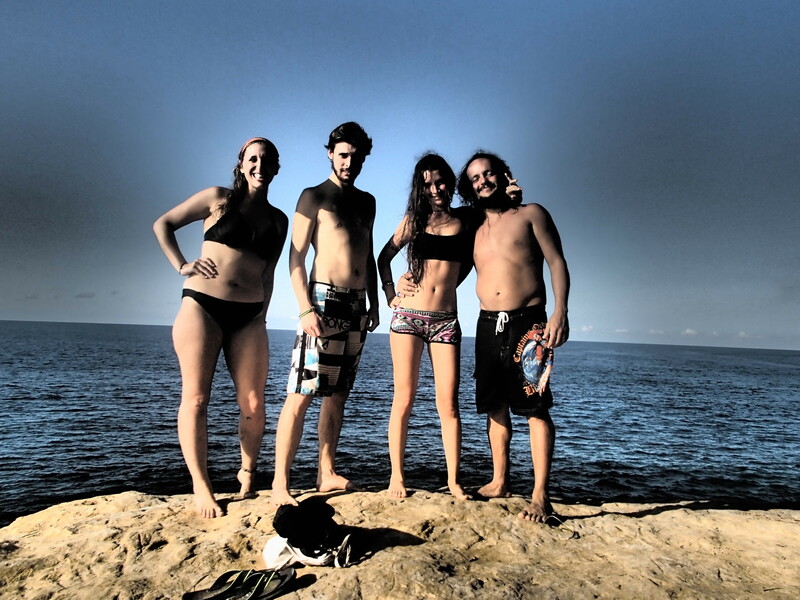 Yesterday, the small family I´ve grown to love here hiked to a gorgeous lookout point at Punta Uva. While sitting along the rocky point, the waves crashing along the sides, the sun setting on the water before us, reflecting back all of its soul pumping sunshine onto us, someone began strumming a ukulele from the ledge above us. I´m not kidding. This was real life. This was my life. But saying goodbye is part of the life of a traveler. Saying goodbye to paradise and the many forms I´m sure it will manifest itself in throughout my trip will become as second nature to me as throwing toilet paper in the trash can. It´s time to say goodbye to Costa Rica and the woman I was here. Which parts of her do I want to take with me? Which parts do I leave behind for the sea to reclaim like a piece of driftwood? The oh-so-appropriate water blur on this photo is hilarious to me. The person I was here was timid, believe it or not. I was scared, afraid of sticking out too much or sounding stupid when speaking the broken and littered Spanish I know. I apologized for the space I took up in the world, being a tall and large girl, and I regretfully informed people where that space hailed from – the dreaded America. In moving on, there is little I can do to change how I look and where I come from. These are pieces of me, pieces that make me who I am and I refuse to apologize for them any longer. So let the sea wash away these pieces, but leave the person behind who is able to find comfort in solitude. ¨Cool¨has become such a complicated word – each country having its own understanding of what it means – that it´s impossible for me to embody such a word. So better to focus on expressing who I truly am. With that comes my sense of style, something I abandoned in favor of clothes that were basic and functional. This was an idiotic oversight on my part. A woman whose main form of self-expression has been style cannot have her individually ripped from her hands in a moment where she is clamoring to anything familiar that she can find. I miss my brightly colored clothes, fitted and flirty dresses, and the feeling of feeling pretty. It´s a small thing that becomes magnified as time travels on. One of the biggest takeaways is the level of control I have over my own happiness. Happiness is not relative, like cleanliness. Happiness is right there in your backpocket next to your colones and your fuego. There was also a long adjustment period here. It took me a couple weeks to finally let everything sink in, from the language, food, culture, new surroundings, climate, people, and work, everything took some level of understanding to get to place where comfort was at least in relative reach. Moving forward, I know I have control over how long it takes me to feel comfortable, and the longer I take feeling like an outsider, the longer I will remain one. So much gratitude for my Se Ua family. My time in Costa Rica would not have been the same! 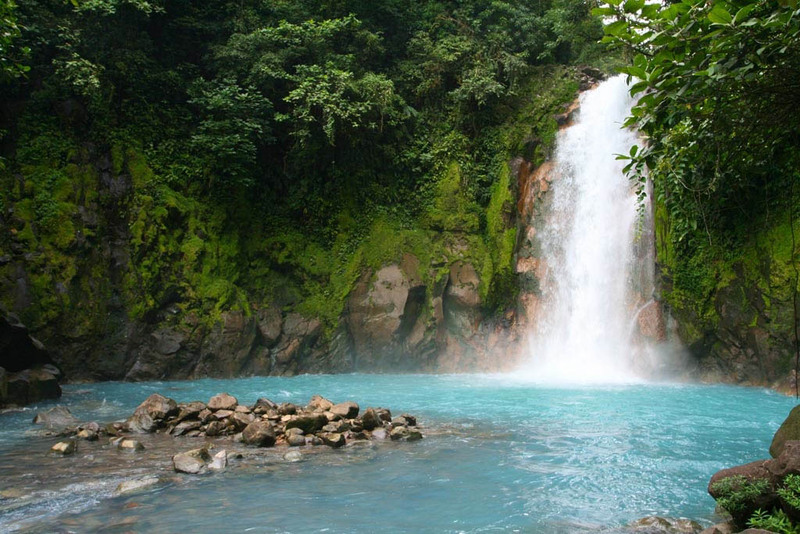 So I´m into my first week in Costa Rica and so far….it´s utterly amazing. Truly. Like every single one of my dreams from the last year is coming true. Every moment I sat at my cubicle wishing for a different life, desiring a different daily than the one I had been granted, wishing desperately for change and adventure. Every moment igniting a passion for the life I´m now chasing. And I can actually taste it because I´m in it, every day now. My daily life consists of waking up at whatever time I choose. I don´t go out very often here because truly I don´t feel very safe yet, being on my own, but that will subside with time, my level of comfort directly proportional to how much Spanish I currently know. Which is still un poco. Muy pequeno. But I´m trying to learn and I want to learn, that´s for damn sure. Because it´s not really fun to constantly be out of the loop. And it´s not even just Spanish, the amount of English I hear is minimal, at best. I hear German more than I hear English, truthfully. Spanish will be a challenge to learn, a challenge for my mind that I welcome with open arms. Like the books I´ve been devouring and the journaling I´ve been doing – all of it adding back nutrients to my malnourished soul. Yes thats a tad dramatic. Yes thats a tad necessary though. I hope everyone is watching my posts, drooling over my pictures, reading my words with a fervor that inspires them. Because I want everyone to do this. To follow their dream. To make this happen for them. To create the life you want, instead of the one you´ve settled for. I understand that things like marriage, kids, debt, money, time, or careers can all get in the way, but there is no excuse not to take a vacation you´ve dreamed about or quitting a job you can´t stand to do something you actually enjoy. Life is too short, our bodies too fragile, and our mind too powerful to ignore what we truly want. 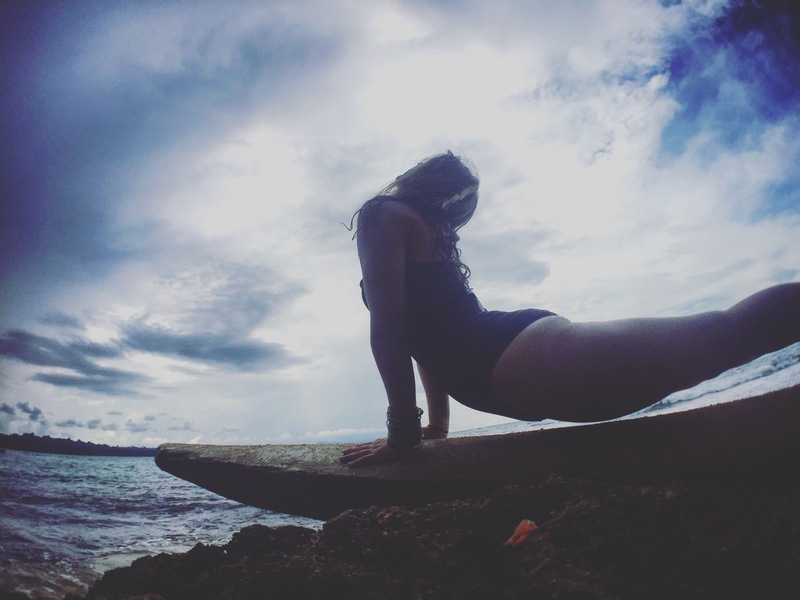 Here is a synopsis of what I´ve done so far in my week: I´ve gone hiking along Volcano Brava, I´ve gone swimming in a waterfall, I´ve biked over 20 miles in a day, I´ve done yoga on the beach and in hostel gardens and alongside mountains, I´ve made friends with Costa Ricans, Frenchmen, and Argentines. I´ve slept in a hammock against the shoreline of the ocean, I´ve swam in waves with such force that it literally knocked me over, I´ve made strangers into unforgettable friends, I´ve driven miles over gorgeous hillsides covered in so much green I´ve actually forgotten what the brown flatlands of Texas look like. I´ve been happy, lonely, sad, ecstatic, and fulfilled in a way I haven´t felt in too long. And that´s just one week. There have been hardships already as well. Struggles, stress, nervousness, anxiety, cash issues, bus confusion, disastrous laundry mishaps and all the other annoyances that accompany travel as well. And there is fear (¨Which is born to an extent of a story we tell ourselves¨) but all of that is taken in stride and in comparison to what I have. Solitude, freedom, and a better attitude than I´ve had in the past year – possibly ever. So I suppose it´s a trade worth making. I can´t wait to see what other swaps are in my future. Stay tuned, maes (dudes). As my countdown to leaving for South America continues to dwindle down (less than 75 days at the time of this post!) my planning is getting kicked into high gear. 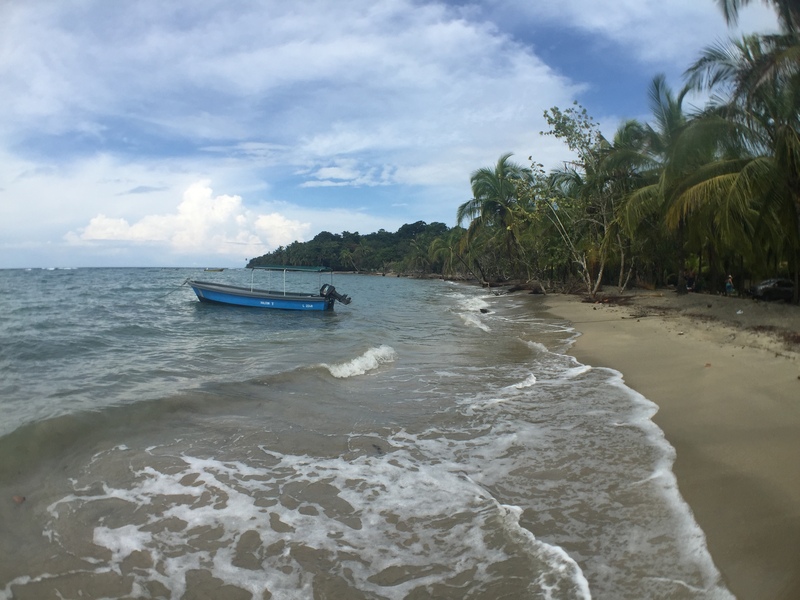 This week I finalized my first workaway in Costa Rica in the town of Manzanillo, in the Limon region of Costa Rica. 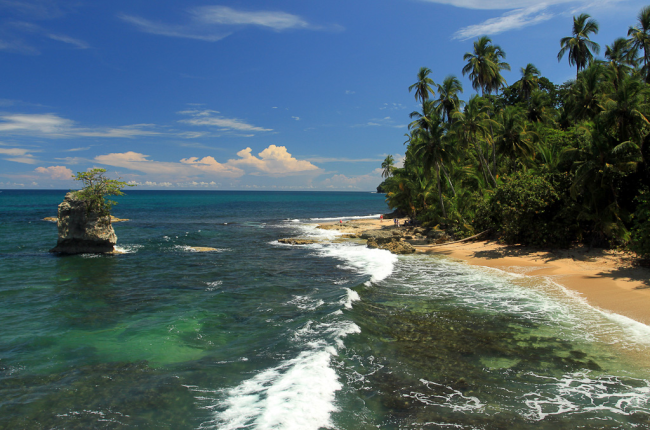 It’s on the Caribbean side of Costa Rica and it’s literally the end of the road as it stops at the Gandoca-Manzanillo National Wildlife Refuge. But actually – the place I’ll be volunteering is literally IN the refuge. Like…in the jungle. Surrounded by trees. With no hot water. So it’s hard for me to look at this photo and be scared. It’s hard for me to watch this video and be anything but excited because this place looks like untamed paradise. 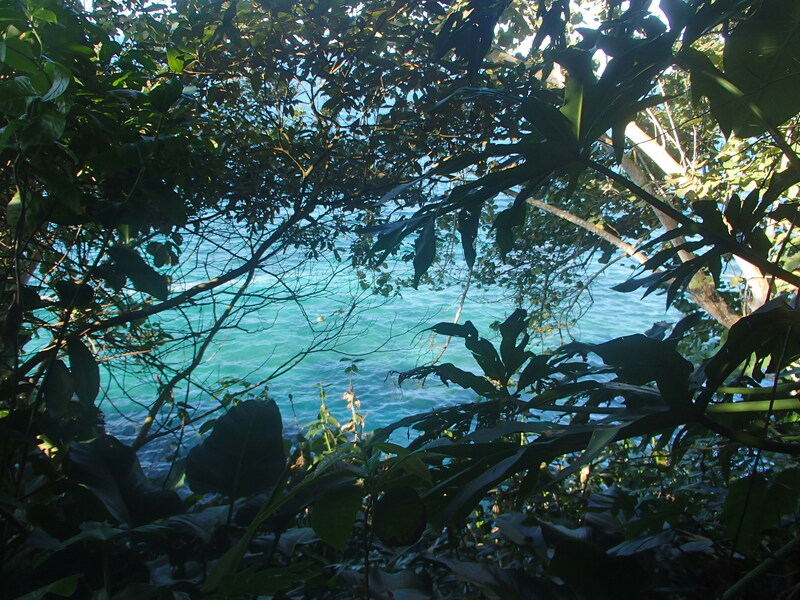 Secluded, away from civilization, smack in the middle of nature with not much else to do but swim, maybe learn to surf, hike, and lay in a hammock I can’t imagine anything I would really want to do more. 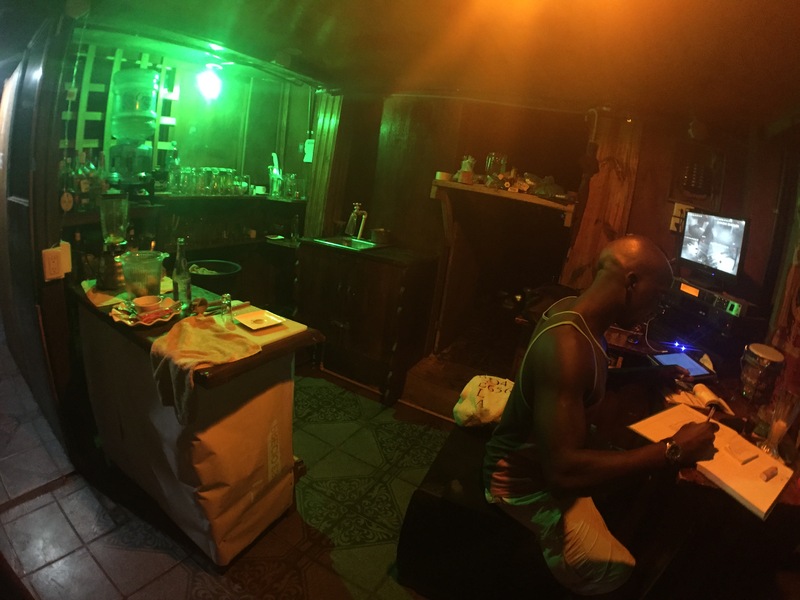 The hostel itself is run by two Costa Rican cousins who have built everything using recycled materials from the land. They have activities and tours they are trying to promote and need help with general maintenance and upkeep of the hostel. I’m booking my first hostels, arranging travel details, figuring out if a river tour down to Puerto Viejo would be better than taking a van throughout the country, seeing how it’s possible to see surfing towns, volcanos, cloudforests, and mountains all in my first week. My head is swirling with visions of Caribbean rice and beans, drowned with ideas about hiking and kayaking, and completely losing touch with my reality here in Texas. 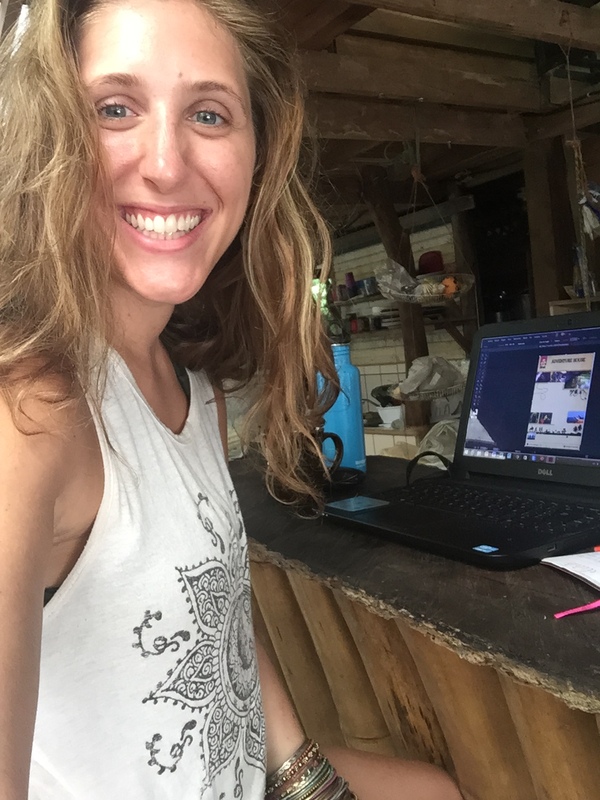 I fall into deep holes of planning – losing my footing in planning things like Patagonia or hiking the Inca trail, finding myself resurfacing back at bus routes to Bolivia and finally realizing that THIS is about to BE my reality. 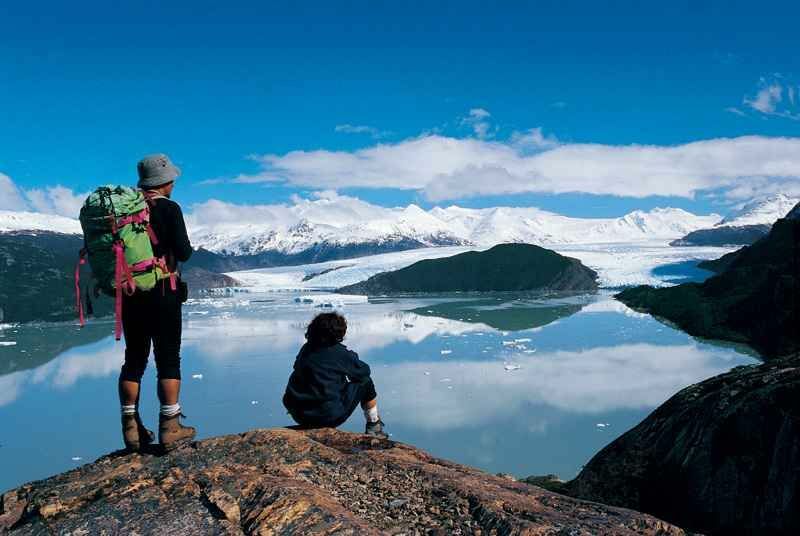 I begin to wonder if I’m cut out for it all, if I’ll end up killing myself by climbing a tree and then plummeting to my death in the Amazon or if I’ll freeze high in the Andes determined to make it to Torres del Paine. Again, I resurface, taking a deep breath. Back tracking to Panama. Realizing I’m getting far too ahead of myself as I’ll have several countries and other crossing and obstacles to address before my fears ever get in the way. I think back to my first time camping on a tiny island in the middle of our lake in Wisconsin. 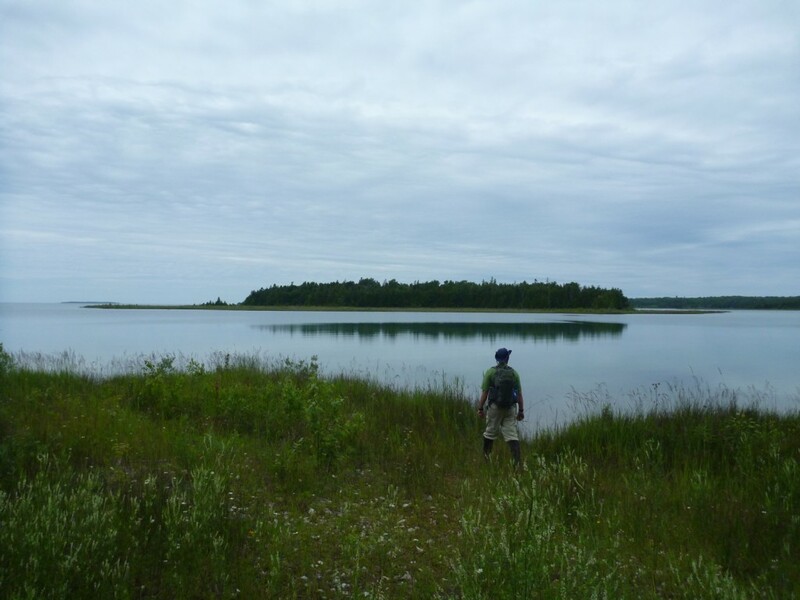 I brought open food with me, I left the tent unzipped for lengths at a time, I was eaten alive by bugs, and when I got back to our warm, insulated, dry, and bug-free cottage my family gave me hell. I wasn’t cut out for it. I was a city girl – born and raised – and I wouldn’t be able to ever go camping again. I didn’t go camping again for almost 15 years until an ex-boyfriend suggested we go. Terrified beyond belief I agreed and the trip comprised of roasting peaches on an open flame, drinking wine and telling stories, and being shown how to pitch a tent and maintain a fire. Fast forward to camping in the Redwoods without anything to spark a flame – except lighting every single piece of paper in car on fire and hoping to hell it works. Now I’ve gone camping in Arkansas, parts of Texas, Oklahoma, New Mexico, and Arizona and I clearly don’t intend to stop anytime soon. The only thing stopping me before were my own insecurities, bred long ago by an incapable young girl – conquered by the strength of young woman’s determination. Part of planning is preparation. But I think preparing for what is to come is proving to be the most difficult part. Letting go of all my belongings – selling all my furniture, clothing, and adopting a backpack for the next year. Leaving behind friendships that mean the world to me in favor of the actual world out there. Laying aside doubts. Lightening my load by paring down to bare essentials in every aspect of life. Listening to the voice in my head the keeps telling me how badly I want this . Locking out the voice that tells me I’m not cut out for this. These are the things that are more difficult to plan for. There’s no vaccination for homesickness or any amount of waterproof wicking to whisk away all my doubts. But as each day closes and another one begins, I’m inching my way to an eventual plane ride away from everything I’ve ever known in my life. That unknown that I’ll be throttling towards can’t be planned for. There is no way to Google it. But it’s something that’s equally alluring because it can’t be understood until I’m right there in it – watching the life I’ve known fall away and the life I’m choosing coming into focus.